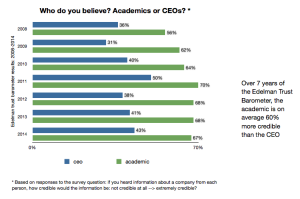 Why do we trust academics more than CEOs? Last week the new Edelman Trust Barometer confirmed that there is no public figure we trust more than the academic. This has been a pretty consistent finding since the start of the survey in 2001: academics average 65% trustworthiness with little variance between years. Meanwhile, our perceptions of all the other roles featured in the Trust Barometer are changed by events and trends. The trustworthiness of “people like us” has risen with social media: 47% credible in 2009 and 62% in the 2014 survey. 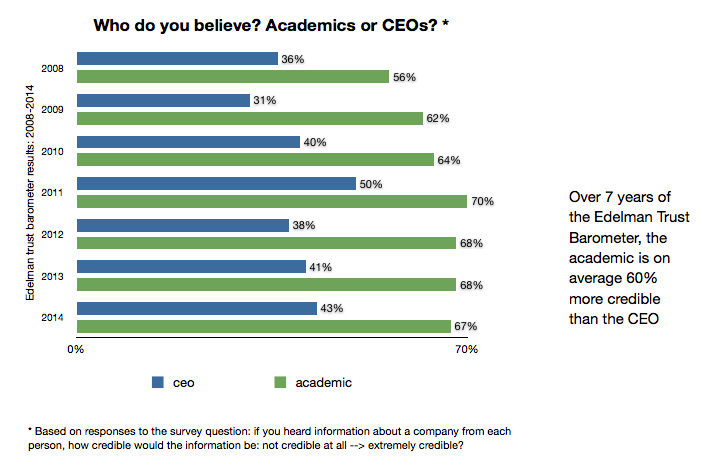 Our trust in CEOs varies wildly, dipping to 31% just after the fall of Lehman Brothers. Are academics just more trustworthy? I doubt it. They’re as human and prone to temptation as CEOs. If you look long enough you’ll find cases of shameless plagiarism, where scholars claim the work of others as their own original research. If you’re inclined to believe the documentary ‘Inside Job’, professors made stacks of money legitimising the corporate strategies which caused the credit crisis. Even if you accept the reasonable defence that they weren’t hired as clairvoyants, they were still less than open about conflicts of interest between their consultancy income and their research. In other words, the distance that allows academics to think independently was not obvious. As Orit Gadiesh of Bain pointed out in an excellent Davos debate last week on surveillance (20’40” of the webcast), it’s not enough to earn trust. You need to be seen to be earning it. So if there aren’t obvious moral differences between academics and CEOs, the question turns back to us. Why do we trust academics more? I think we trust them in large part because their lives are simpler. Look at the tensions managed by senior people in firms. They struggle daily because organisational life is littered with tensions that are hard to resolve. Collaboration vs dissent is a typical example. We admire collaboration because teams don’t function without it. We also admire dissent because without it you don’t get innovation. On their own they each make perfect sense. Put them together and they fight: too much collaboration can make groups think like sheep, and if the culture is all about the dissenting individual, collaboration usually exists only in the company’s rhetoric. The ideal everyone agrees (practitioners and scholars alike) is to juggle opposites so that no one side prevails. However real people are often forced to make ugly choices. Think short term vs long term goals, or the uneven incentives that get in the way of the triple bottom line. For academics the stakes are much less high. The main tension of their professional life is research vs teaching, and yet indifferent teaching often incurs no sanctions in universities. Outstanding research builds reputations and so should great lectures. Some academics juggle both very well, particularly where both are equally incentivised, but teaching remains an afterthought for many – at least in this country. In fact, judging by a recent project I carried out, a significant minority of academics still think it’s fine to see all forms of marketing (including adapting to what their customers/students want) as the enemy of academic integrity. If they think this it’s because they’re allowed to. Trust is portrayed as a kind of richter scale we apply to all human activity: an absolute standard which people pass or fail. This feeds a belief that trustworthiness is all about the individual. My father mistrusted people whose eyes were too close together, and it was a seductive theory. But we should also factor in the nature of the challenge. It’s arguably harder to be a trustworthy CEO than a trustworthy academic, and it’s certainly daft to assume their lives have the same levels of complexity and risk. Great provocative piece. Could it also be because academic output is seen as affecting our financial well-being less directly? Politicians, bankers, estate agents – they all are seen as being on the make at our expense. Whilst academics can actually make an immense difference to our long-term welfare, their influence is generally seen as being dependent upon our own receptiveness to their research or their teaching as individuals. As an academic, I chuckled at the idea of my life being simpler. Do captains of industry spend their time pondering the ramifications of a Cartesian subject-object split versus a Freudian divided self in understanding suffering? Or how a discursive turn heralds the demise of the subject? No. I think we are trusted because we do passionately care about something that, in the overall scheme of things, matters so little. Previous post: Don’t say what you’re not. Say what you are. Next post: Do brands make life too easy?